Assemblies and Parliamentary Hemicycles have always been the core of democratic debating. They are the places where through discussion and the exchange of different ideas, popular sovereignty and political transparency are attained. This is why it is most important that debates in Assembly Halls or interventions on behalf of the various political groups are managed and planned in full as well as abiding with democratic regulations. Thanks to technological advancements, today modern assemblies are provided with a wide range of computerized solutions, such as the Speaker Management System designed by Eurel Informatica S.p.a., thus ensuring that the above system is able to perform quickly and efficiently. 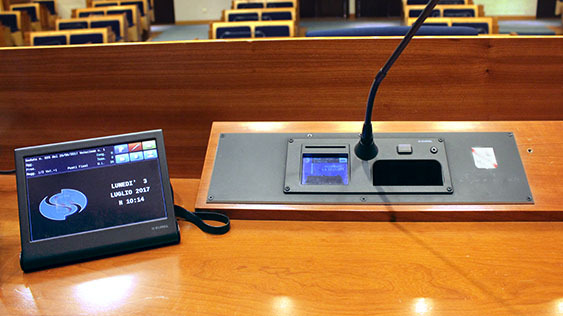 This specific module, the Multimeda Integrated System enables managing to the full the voices speaking during debates held in Assembly Halls or Hemicycles. Thanks to Speaker management, for example, the Chairman of the Assembly is able to completely control activities involving debates as well as how interventions are conducted. What are the advantages offered by a Speaker Management system? An excellent solution is now available for managing Speakers, thus debates may be best planned and consequently all the Members in a Hemicycle or Assembly Hall may efficiently cooperate along their various performances. Eurel Informatica S.p.a. offers a Speaker Management System that is integrated with the other functionalities available with the Multimedia Integrated System involving organization, reporting and broadcasting the Acts of the Assemblies.